Polish historian and communal worker; born in Warsaw 1820; died there 1895. He was educated in the Warsaw rabbinical seminary, and began social work early. For some time he was in charge of a school for Jewish boys, founded by himself. 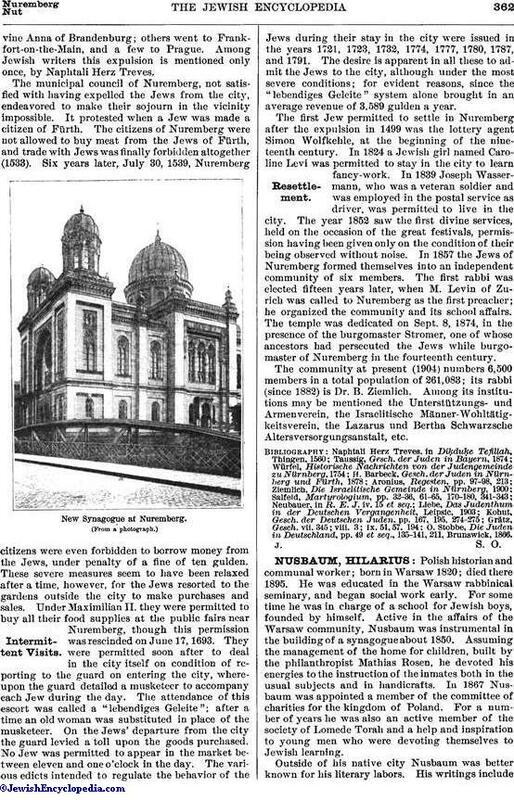 Active in the affairs of the Warsaw community, Nusbaum was instrumental in the building of a synagogue about 1850. Assuming the management of the home for children, built by the philanthropist Mathias Rosen, he devoted his energies to the instruction of the inmates both in the usual subjects and in handicrafts. 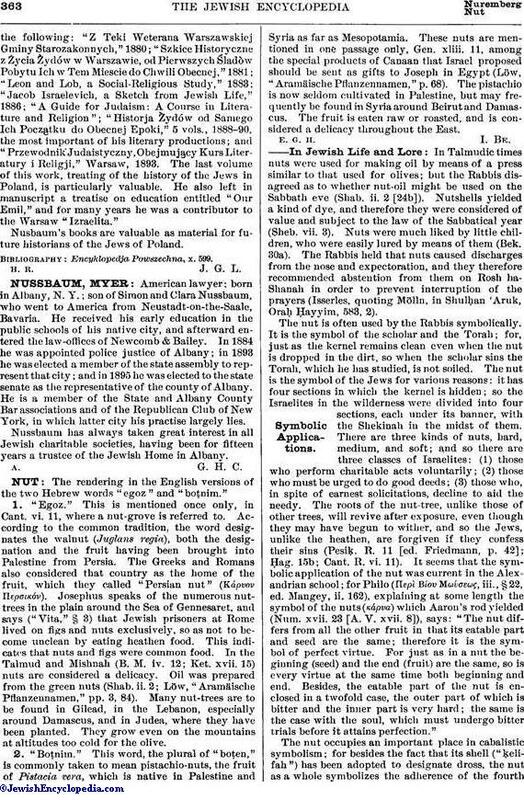 In 1867 Nusbaum was appointed a member of the committee of charities for the kingdom of Poland. For a number of years he was also an active member of the society of Lomede Torah and a help and inspiration to young men who were devoting themselves to Jewish learning. Outside of his native city Nusbaum was better known for his literary labors. His writings includethe following: "Z Teki Weterana Warszawskiej Gminy Starozakonnych," 1880; "Szkice Historyczne z Życia Žydów w Warszawie, od Pierwszych Śladòw Pobytu Ich w Tem Miescie do Chwili Obecnej." 1881; "Leon and Lob, a Social-Religious Study," 1883; "Jacob Israelevich, a Sketch from Jewish Life," 1886; "A Guide for Judaism: A Course in Literature and Religion"; "Historja Žydów od Samego Ich Pocz tku do Obecnej Epoki," 5 vols., 1888-90, the most important of his literary productions; and "Przewodnik Judaistyczny, Obejmuj cy Kurs Literatury i Religji," Warsaw, 1893. The last volume of this work, treating of the history of the Jews in Poland, is particularly valuable. He also left in manuscript a treatise on education entitled "Our Emil," and for many years he was a contributor to the Warsaw "Izraelita." Nusbaum's books are valuable as material for future historians of the Jews of Poland.